The Paragon, the first book in a series, has been published and is available for sale in an e-book format on Amazon. Only $0.99 (USD). One dark night, a horse-drawn carriage, traveling through a lonely, haunting forest, transports a young, nervous man to the door of an ancient, towering manor house. It is there that Samuel Wallis learns about his mysterious, late grandfather and a strange will made out to him. One condition of the will is that Sam locates a treasure, an enigmatic treasure. Sam must follow a trail of clues, which lead him across continents and oceans to a discovery with great implications for the future of Earth. At the same time, a powerful villain and his henchmen are seeking the same thing Sam is after and they will stop at nothing to get it. 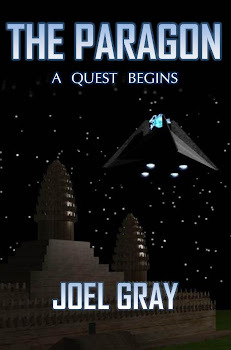 Click here for a free excerpt from The Paragon: A Quest Begins on scribd.com. This is a video book trailer for The Paragon: A Quest Begins. Read an excerpt. The wind blew across the sandy plain, stirring up small vortexes of dust. Check out Joel's blog, Space for Swashbuckling, Sci-fi, and Suspense.